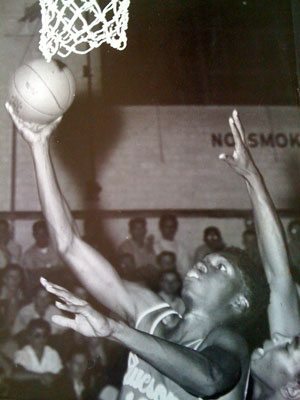 I was just looking through my scrapbooks and I came across two pictures of me playing high school basketball 55 years ago. In one I was going in for an easy basket, a lay up, with my left arm shielding my defender from the play. 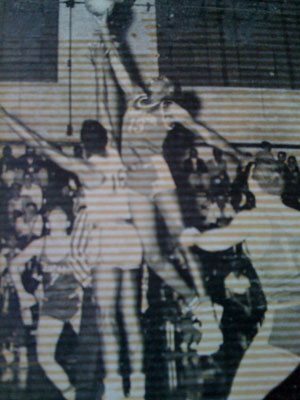 In the other I’m springing high to win the opening tip of the same game, the first game in Pueblo High’s history. Their school building was still under construction, a few months shy of being done. We were housed in my school, Tucson High, the oldest public school in the state of Arizona. It was an explosion of guffaws and caws and thigh clapping and foot tapping – bragging rights were up for grabs but we got the last laugh. Looking back on it, though, we were supposed to win but it definitely wasn’t akin to a leisurely hike in Sabino Canyon on a nice sunny spring day. No way. Those Warriors made us Badgers scratch and crawl for every point we made or rebound we got. The lead must have changed every other play. We, the old timers, couldn’t get a rhythm going because they, the young upstarts, were in our way like bratty kids who have no respect for their elders. A game that was supposed to be a runaway turned out to be, instead, one heck of a contest. I think both teams felt a considerable amount of pride in how we initiated a decades long rivalry, treating high school basketball aficionados with a lot of suspenseful drama on a historic sports night. Being around each other everyday we players went on and on about it the rest of the year, building up steam for the next season. And out of that relationship we bonded. An “I’ve got your back” form of love and respect between the schools came into being. It, too, was about pride, pride in school, pride in community, pride in race, in our ethnicities, our identities, who we were and who we might become. We responded to our social and political realities as citizens of Arizona where questions of race have always been right at the surface, ready to fly up close and personal – in your face. Both Tucson and Pueblo high had significant numbers of students of color and there were a lot of conversations around town about who was attending what school and what “color” they were with the obligatory insinuation that any school that has too many Negroes or “Mess-cans” can’t be all that good. But we stood proudly and contributed to making our schools good places to learn, cool places to be. And standing Brown and Proud, in particular, is the order of the day for Latino and Latina students in the city today. And it pleases me knowing that Tucson and Pueblo High students, many years after my day, are still looking out for each other’s interests, that not too long ago they walked side by side in protest of Arizona’s hateful attack against the teaching of their history – Mexican-American and Chicano history. They’re fulfilling a legacy, continuing to strive to be decent dignified human beings who are determined to right injustices, who will keep on pushing to enjoy once again free access to studies that have turned them on to their true history and where they fit in such a history, guiding them to think about how they can take lessons from that history that will help them turn their world around. They, the seekers of “liberty and justice for all” that they are, appreciate that young children like them, today and down the way, will need to feel that they belong, that they are of worth, of human value, that they, as contributors to the betterment of their world, have the right to stand Brown and Proud. They must or society will have grossly failed. And it all started with a basketball game, the beginning of a rivalry. Asi es la vida. Go figure. Photo Courtesy of Jacob Ruff via flickr. Ernie- “I’ve got your back” is an important concept. We learn that in sports, and we learn that as big kids looking out for our younger brothers and sisters. And now as adults we have the opportunities to make sure that “I’ve got your back” extends to neighbors and fellow citizens who should not be left unprotected. A terrific post. thank you for that reminder. Hey, I’ve got your back and I know you’ve got mine. Very cool photos and thoughts. Once again you remind us of the importance of a place for ALL to belong. Right on! Ernie! …..will pass through San Diego next Friday and Sat before returning back to the bay…would love to hook up our girls…Cori is trying to get in an RN program while working for Kaiser in La Mesa..hope all is well with the fam. Great article! Do you know that I never got to see you play? Incredible, isn’t it? Anyway, you were the best! Keep the good words flying. Yeah, because you took off for L.A., leaving us Tucsonans to mourn. I don’t think we ever got over it. But you got to see my great “mind” at play (smile). You were able to fly even without feathers. Well, my feathers were hidden.